The trains in Europe are modern, fast, and fun - and will take us wherever we want to go. This proposed itinerary is meant to give you a highlight of some of our possible adventures. I've visited all of these cities on past trips, some multiple times, and know how enjoyable they are. Our itinerary will be fine tuned throughout the spring, summer, and fall and boys are encouraged to send in their suggestions. Once fall gets here, we will start to book our lodgings. But even with a set itinerary, we're still able to choose other cities (and countries) to visit from our base cities. Our first-class Eurail passes give us amazing opportunities to explore nearby destinations. Eurail serves 10,000 great opportunities in 28 countries. This itinerary gives us a great taste of Western Europe. The cities we'll be visiting include a combination of pretty big cities and smaller cities.They offer a wonderful combination of incredible scenery, architecture, history, food, and fun. All of the cities are very walkable, but they're big enough that we'll also need to get to some attractions via trams, buses, etc. And of course, there's always the unexpected discoveries we always make. Even though most of our train routes will be booked in advance, our passes let us take spontaneous day trips to other cities and villages if we decide we want to. It's all quite the adventure. We're planning on flying into London and after breakfast we'll spend the day exploring this amazing city. Over the next couple of days we'll continue to take in all we can. Highlights of our stay will include chances to see Westminster Abbey, Buckingham Palace, Trafalgar Square, and the Tower of London. We'll get a birds-eye view of the city with a trip on the London Eye. Boys who are interested will get a chance to see a theatrical production in the West End. We will depart London via the Channel Tunnel (the Chunnel) on a Eurostar train and will arrive in Paris in just over two hours. Standing guard at Buckingham Palace. Big Ben with the London Eye in the background. It is amazing to think of stepping off the train having been in London just hours ago and walking straight into French history. We'll have two full days to explore what we can in the City of Lights - Paris. Of course we'll make a trip to the top of the Eiffel Tower and we'll spend some time at the Louvre. We'll also counter the amazing art work at the Louvre with incredible weaponry at the Military Museum (one of the most comprehensive museums of military history in the world). We'll certainly walk along the Champs-Elysees and will visit the Arc de Triomphe which is where the French have their "Unknown Soldier" memorial. We'll tour inside Notre-Dame, the famous cathedral whose first stone was laid in 1163. The Military Museum in Paris will amaze you. 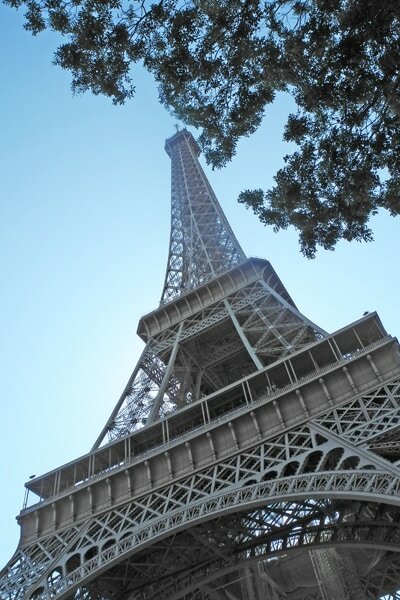 Advance tickets for the Eiffel Tower will save us hours of standing in line. 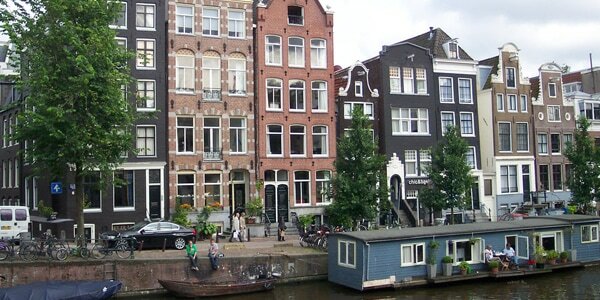 Amsterdam is another vibrant European city that has loads of charm, not that boys are necessarily looking for charm! There's really no other place like Amsterdam with its miles of canals and a trip to Amsterdam wouldn't be complete without a boat tour of the city via the canals. Boys can choose to visit the Van Gogh Museum or the Rijksmuseum and we'll balance that out with a visit to Nemo, the national science center. We'll have a docent talk at the Anne Frank House before walking through "The Annex." Boys will enjoy an improvisation comedy show at "Boom Chicago," a lively audience-participation show (performed in English). We will also tour the Heineken Brewery which has been a favorite stop on past trips. With parents' permission, boys will also have a chance to walk through the seedy side of Amsterdam, the "Red Light District." If we have time, we'll also plan a short excursion to Haarlem, a smaller city just a few minutes from Amsterdam. Haarlem remained relatively undamaged by both world wars and the old center of the town has authentic origins dating from the 13th century. There is a highly decorative organ in the Grote Kerk (a church) that has been played by both Handel and Mozart! A houseboat moored "permanently" on an Amsterdam canal. 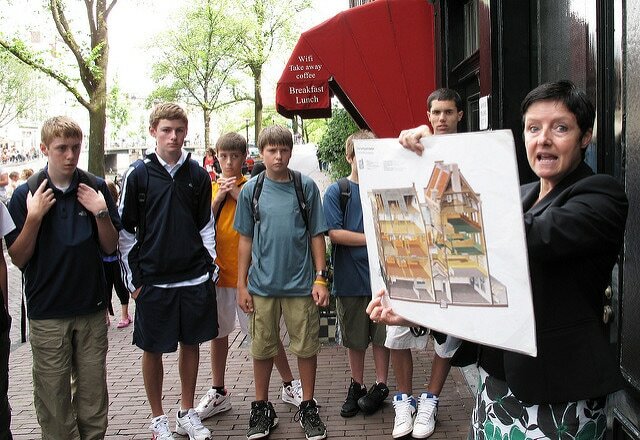 A docent explains the layout of the Anne Frank House in Amsterdam. Berlin is a quick overnight stop on our trip between Amsterdam and Prague. But we'll have time to take in a few interesting sites.We will visit the Checkpoint Charlie Museum which highlights the Cold War period after WW II. The Berlin Wall is gone, but there are remnants to be seen. 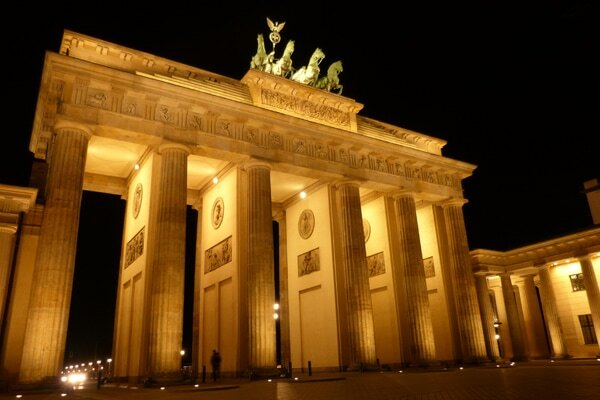 We'll also visit the Brandenburg Gate, which has witnessed many historical events. We will also visit the Fernsehturm, often called "the toothpick" by locals. This 1,206 ft.high television tower soars above the city. We can take an elevator to the viewing platform. Prague is a fascinating city (okay, they all are) that takes us on the edges of Western and Central Europe. Prague is considered to be one of Europe's most beautiful capital cities. One of the most familiar sights in Prague, the Charles Bridge, connects the Old Town with the Little Quarter (Mala Strana). The Little Quarter is the part of Prague that has been least affected by recent history. Hardly any new building has taken place here since the 18th century. Founded as a town in 1257, the area is built on the slopes below the castle enjoying magnificent views across the river to the Old Town. there are many fun and interesting sites to see in Prague. One of those is the Orloj (Astronomical Clock) built in 1410. Prague is also home to the Prague Zoo, consistently rated among the best zoos in the world. Our dollar will go far here as the exchange rate is in our favor. 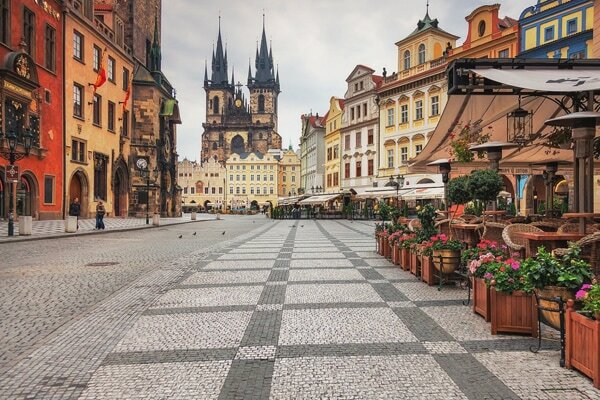 ​Plans currently call for us to spend one night in Prague and then a full extra day. We'll depart in the evening on a night train to Zurich, Switzerland where we'll have breakfast before taking a short ride to Bern. A street scene in Prague. 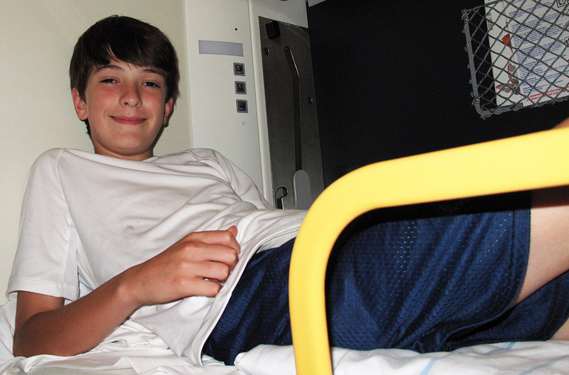 Getting settled into the bunk on the train for the night. Bern is the capital of Switzerland, and its relatively small population will surprise you. Tons to do here. No worries. Bern's historic center is one of the best-preserved in Switzerland, and is also a UNESCO World Heritage site. We'll check out the Swiss Alpine Museum, see the Bern bears, and enjoy a walk right into the heart of Bern's ancient walled city. It is from Bern that we'll also take a day trip to Interlaken where we'll switch trains to ride up the Alps to the village of Grindelwald. It's here you might just have to purchase a Swiss Army knife. 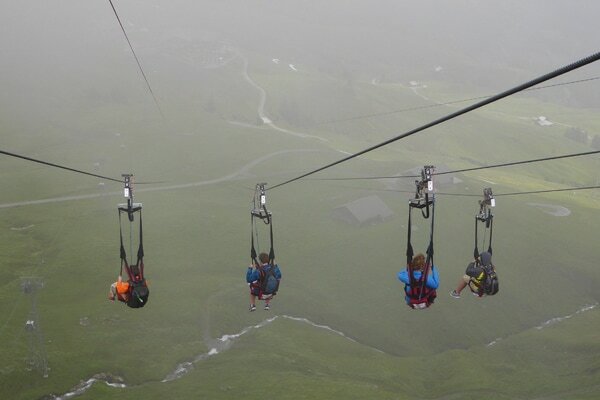 It's also in Grindelwald that we'll experience a really "cool" adventure by taking a gondola high up into the alps where we'll then descend by three modes of transportation: a zip-line, a scooter, and by foot. This was one of many highlights from the 2015 trip that we're repeating in 2018. 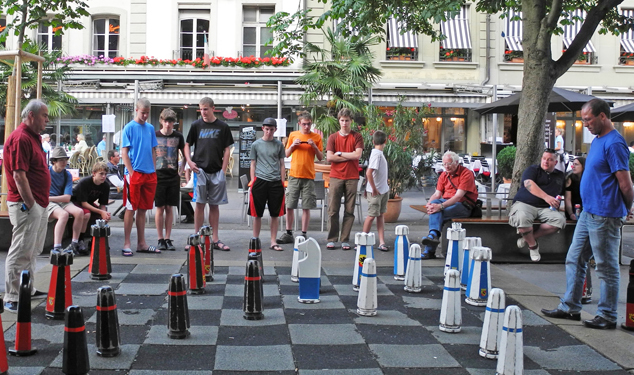 Watching a chess match in Bern. Boys also got to play. 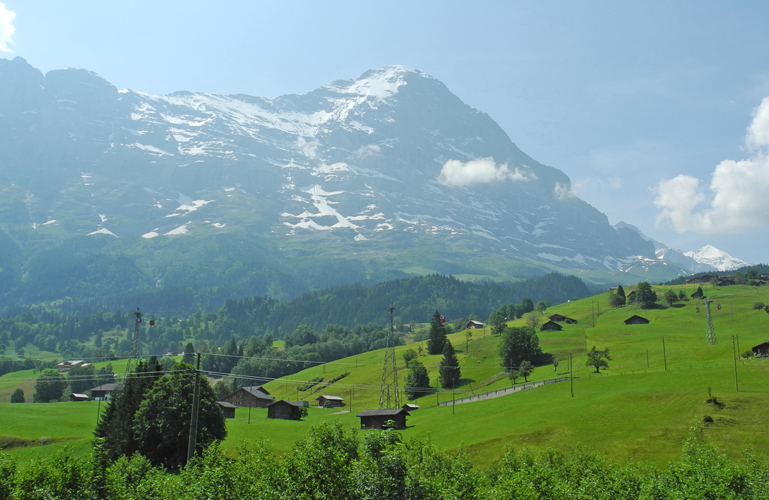 A view of the Alps as we approach by train to Grindelwald. Starting the descent down the mountain in the Swiss Alps above Grindelwald. 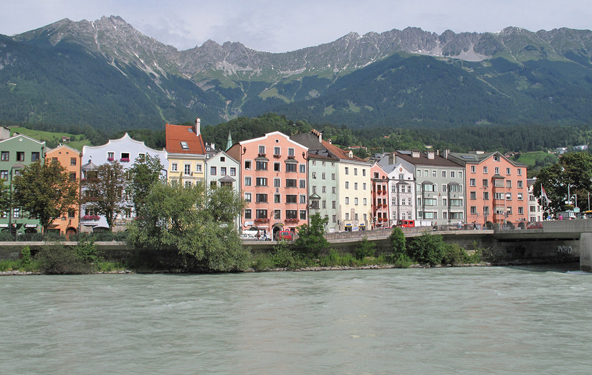 Innsbruck is beautifully situated on the Inn River and is at the heart of the Alps. The city is relatively small making it easy to explore its maze of picturesque streets. Dramatic mountains encircle the city. The best way to experience the landscape is on foot. We'll take a series of cable cars and gondolas up to a high point in the Alps, or…maybe you'll want to hike part of the way up. On the way back down we'll stop at the Alpenzoo. We'll check out the Imperial Palace and Olympiaworld. 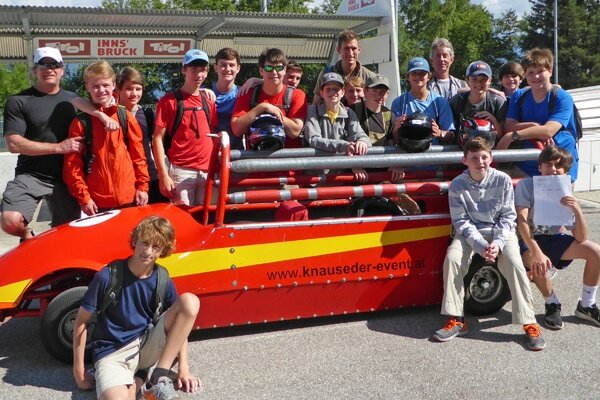 Boys will also get to take a ride on a summer bobsled down a track at blazing speeds with a bobsled "pilot." This activity was another of our highlights from the 2015 that boys will definitely want to experience. From Innsbruck we'll take a day trip to Salzburg. Some of the landmarks we'll choose from include the Hohensalzburg Castle and Fortress, Haus der Natur, Mozart's birthplace, and the toy museum. 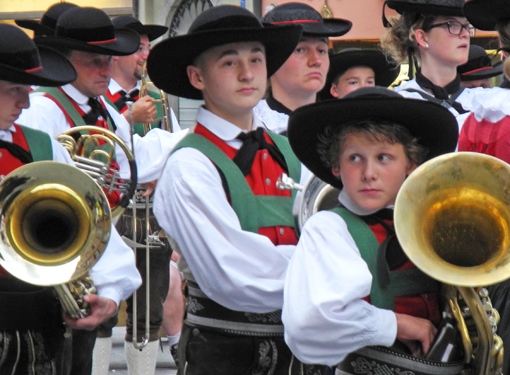 A colorful and tuneful scene we happened upon on a MTA visit to Innsbruck. A view along the Inn River with mountains in the background. The 2015 group after our summer bobsled run. An adrenaline rush for sure! Hohensalzburg Castle & Fortress in Salzburg. Our trip will end with three nights in Munich, the capital of Bavaria. Munich is one of Germany's most appealing and popular cities. Even though Munich is the country's third-largest city, it has retained a village-like atmosphere with parks and a pedestrian-only center. There's a lot to do and enjoy in Munich, but having this extended stay will also give us a chance to take a local train and get out of town to check out the nearby town of Regensburg, another UNESCO World Heritage site. Passau is another day-trip possibility. 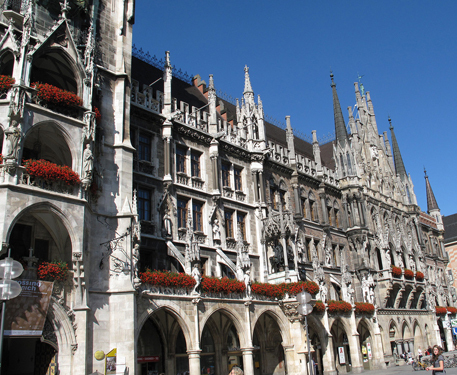 We'll enjoy spending time in the Marienplatz which is a fantastic walking area filled with shops, restaurants, and attractions. We'll also spend a few hours at the Deutsches Museum, a really fascinating museum of science & technology. We'll have dinner one night in the famous Hofbrauhaus, tour the BMW museum (after all, Munich is world headquarters for BMW), and enjoy some walking in Olympiapark. We'll also have a somber visit to Dachau, a WWII concentration camp where a guide will help us understand this part of history. Munich offers an incredible variety and it will make for a memorable last stop on our 20-day adventure. Boys will return home with memories to last a lifetime. A view of Salzburg from high up at the Hohensalzburg Castle & Fortress. This itinerary will hopefully give you an idea of what can be in store for you on your European adventure. The trip is 20 days long and there's a lot of planning yet to do. Boys are encouraged to send in their suggestions. We can't get to everywhere and we can't do everything. We also don't want to plan out every minute of every day. There are times we'll all enjoy just sitting down and enjoying a rest in a park. But of course, we'll want to do all we can to make the most of all the opportunities we'll encounter. You'll come home with a better understanding and appreciation for the culture and history of Western Europe. You'll become experts at reading train schedules and maps. You'll be an old-hand at figuring out how much something in euros is actually costing you in US dollars. And if you want you'll get an opportunity to practice your French, German, Dutch, or Czech. But don't worry, your English will work too! I hope you'll be joining us in June 2018 for this grand world-class adventure.